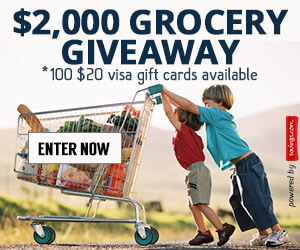 $2000 Grocery Gift Card Giveaway | A Savings WOW! 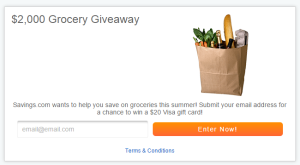 Savings.com wants to help you with your groceries by giving away $2,000 in Visa gift cards! One hundred (100) winners will each receive a $20 Visa gift card! Enter your email address on the form at the top of the page at Savings.com! As kids get bigger kids tend to eat more. That will be great to win this gift card. School will be starting soon will be nice to win.